You are here: Home » Grace Unplugged Prize Pack Giveaway! 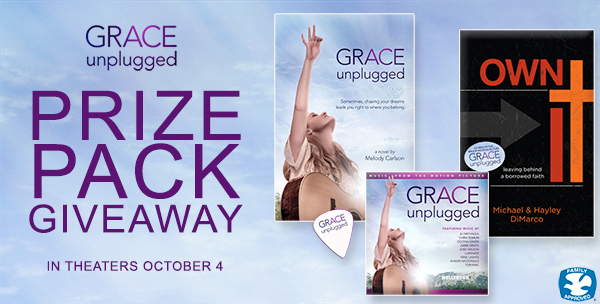 Grace Unplugged Prize Pack Giveaway! I am super excited for the release of this movie! With all the media hype and conversations surrounding Miley Cyrus the timing of this moving could not be more perfect! This is a movie that all tweens should definitely see! Are you ready for a Rockstar Life? Click on the image below and take the quiz to find out! Official Grace Unplugged Prize Pack to be awarded to one lucky reader! • Grace Unplugged Soundtrack CD – Songs by TobyMac, AJ Michalka, Chris Tomlin and Shawn McDonald. To Enter the Giveaway complete each of the following….. Reply with your results from the quiz…Are you Rockstar ready? It says I’m rockstar ready! I followed you on Facebook ! I liked grace unplugged on Facebook! I am rock star ready !! Thanks! I like Grace Unplugged on Facebook. liked on fb Grace Unplugged. I Like Grace Unplugged Facebook page. I Liked Grace Unplugged Facebook page! YOU’RE ROCKSTAR READY! That is fun! I Followed @mamaof3onthego on twitter! Looks like I’m rockstar ready too! …. “You know that it’s important to chase your dreams, but it’s even more important to love your friends and family before fame.” VERY true words! I’m also a fan of the movie!